Vancouver, Canada – March 26, 2018 - Aztec Minerals Corp. (AZT: TSX-V, OTCQB: AZZTF) recently participated in a Mexican government land lottery and was awarded two new mineral concessions covering approximately 3,149 hectares adjacent to the Cervantes property in Sonora, Mexico. 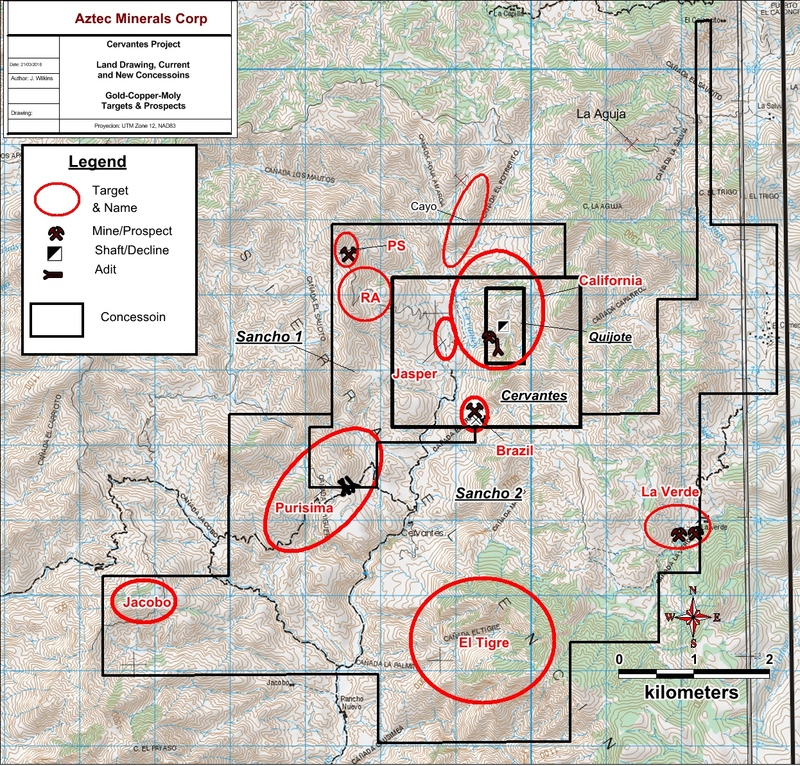 Combined with the 500 hectares currently under option from Kootenay Silver, Aztec’s land position at Cervantes has now expanded more than six fold to 3,649 hectares. Purisima is an undrilled, historic prospect/gossan zone that outcrops 2.5 km southwest of the California zone and consists of two 750 meter (m) X 750 m diatreme breccia bodies. They are composed of volcanic, intrusive, and sedimentary fragments with peripheral sedimentary breccias cemented by specularite+/-barite. Historic chip sampling of the eastern breccia returned two separate 2 m intervals assaying 44.6 grams per tonne (gpt) gold and 5.9 gpt gold. Several grab samples by Kootenay ranged from 0.10 to 0.36 gpt gold with anomalous tungsten values throughout. Quartz-feldspar porphyry intrusions with anomalous copper-molybdenum values and phyllic alteration flank the west side of the breccias. Jacobo is a sill-like body of feldspar-biotite-quartz porphyry measuring 1.7 km long by 350 m wide hosted in sedimentary rocks. Limited historic rock chip geochemical results have a porphyry copper-molybdenum signature. These two targets have seen limited mapping and sampling but several rock chip samples contain highly anomalous gold, copper, arsenic, bismuth, and tungsten. The PS zone is centered on a small north-south quartz vein with visible gold and grab samples up to 243 gpt Au. The RA target is exposed along road cuts with grab samples that contain up to 3.9 gpt Au, 0.21% Cu, 660ppm W, 17,300 ppm As, and 160ppm Bi. The El Tigre target is a 2.0 x 2.0 km Aster satellite anomaly containing anomalous silica and iron oxide, but never sampled by Aztec or Kootenay. The La Verde prospect has some old mine workings but no mapping or sampling have been conducted. The Phase 1 drill program at the California zone on the Cervantes property is now on hole #11 and continues to intersect porphyry-type gold-copper mineralization in every hole. The Cervantes Property is held under an option to purchase agreement with Kootenay Silver Inc. (TSX-V:KTN) whereby Aztec can acquire up to 100% interest in the property in two stages. Aztec also announces that Baroyeca Gold & Silver has received approval for the option and joint venture agreement on their Tombstone properties with Aztec Minerals from both their shareholders and the TSX Venture Exchange (see prior news release). The Company is currently developing its 2018 exploration plans for the Tombstone property, which will include geological mapping, geochemical sampling and geophysical surveys to prioritize targets for drilling. The technical information in this news release was prepared, reviewed, and approved by Aztec Minerals Corp’s qualified person (QP), Joey Wilkins, President and CEO. The historic grab and chip samples are not, to the best our knowledge, compliant with NI43-101 nor verified by the QP and should not be relied upon.